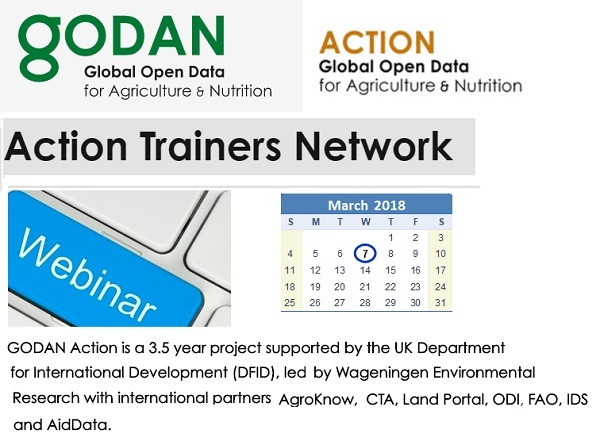 The GODAN Action Trainers’ Network is a network of people actively involved in providing training to support the development of the capacity and diversity of open data users and intermediaries, leading to increased understanding and the more effective use of open data in tackling key agriculture and nutrition challenges. The network supports replication of the GODAN Action curriculum, shares experiences and tips for the delivery of open data for agriculture and nutrition capacity building and identify further opportunities for training. In preparation for the webinar, think of your local context and which stakeholders require training. Which organisations are potential partners? What sort of support would be required?